Update: Nissan was very secretive about their new concept car with only a tease shown to fans prior to the Frankfurt Motor Show that took place this week. All has now been revealed as the magnificent Nissan Gripz Concept took the show by storm. Nissan wanted to create something outside of conventional standards and the Gripz Concept is their interpretation of sports car evolution. The car is made for adventure and excitement taking inspiration from the classic Safari Rally Datsun 240Z sports car mixed with racing bicycle elements. The car is slightly shorter than a Juke, but is wider and lower, emphasising the size of the wheels and creating a more sporty feel. The coupe-type roof sweeps downward to a tail at the rear is inspired by the 240Z. You will notice the incredible 22” wheels and even the steering wheel are both designed around racing bicycles. At first glance you recognise the muscular body as a Crossover model with an adventurous edge. The front is what we expected from the teaser released before the show with the Nissan logo surrounded by strong 3D-lines and boomerang shaped headlights. Around the side the enormous 22” carbon-fibre three spoke wheels instantly catch your eye. The ‘arrow head’ exposes carbon-fibre between the layers connecting to the two scissor doors. At the rear the interesting coupe tail has matching boomerang lights and on the underside a carbon-fibre frame houses two wide exhausts. Nissan states that the "Gripz Concept is seen as a design statement rather than a replacement for an existing model." You may expect the engine to be as striking and muscular as the exterior but the Nissan Gripz is powered by a fully hybrid engine, combining the electric motor from the Leaf model with a petrol engine. Nissan have said that the engine will be “smooth, swift, and linear acceleration in near-silence.” However no specifications were given showing what technology allows the engine to have these characteristics. If you would like to discover Nissan’s current range of vehicles take a trip to Howards Weston-super-Mare. An image from Nissan was released on Monday 7th with the majority hidden from the eye, but it has been described as a new Crossover Concept. Nissan has not divulged even the slightest piece of information regards to the concept in anticipation for the Frankfurt Motor Show on 17th September. 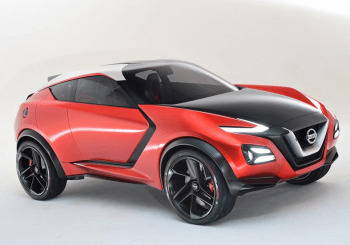 Many speculations are arising from all Nissan enthusiasts in hopes that we will see hints of design and technology that will be incorporated throughout their ranges the near future. From what is available in the image, you can see a more sporty and striking design which is completely different to the hatchbacks and off-roaders we have seen from Nissan in the past. Could we be looking at a sportier future for Nissan? At Howards Motor Group we will keep you updated on the Crossover Concept after all is revealed at the Frankfurt Motor Show. In the meantime take a look at our current range of Nissan vehicles.